Dan Hamhuis may be the most vital member of the Vancouver Canucks. The 32-year-old, Smithers, BC native was struck down with a serious groin injury in a November game against the Anaheim Ducks, and it was reported that he would miss months rather than weeks. Since then, the Canucks have endured a relatively disappointing road-trip only to return home and get blown out by the New York Rangers. 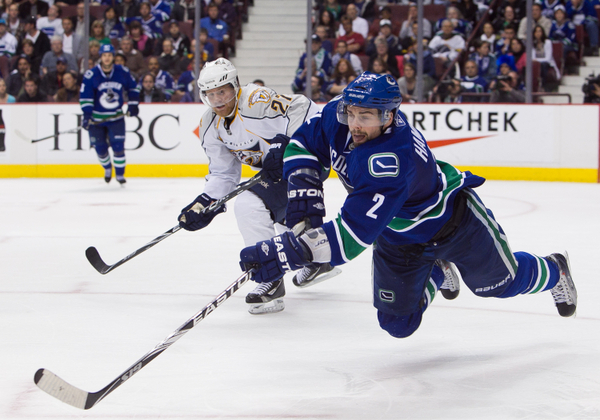 Quickly, the optimism surrounding the Canucks hot start began to fade. The idea of adding another capable defensiveman is appealing, and trading for one would certainly fix a lot of the Canucks problems, but, at this moment, Benning cannot afford a top 4 blueliner. So far, the only defenders that have been traded this season have been of relatively low quality. Eric Brewer went to the Ducks; Bryan Allen and Sergei Gonchar went to the Canadiens; and Tim Erixon went to Chicago. All these trades were done fairly cheaply, but the Canucks defense would not be improved by acquiring any of those players. Gonchar, Brewer and Allen provide depth on the blueline. But the Canucks are looking for quality of quantity. Adding a bottom pairing player does not help their defensive woes, but adds to them, as Allen Brewer and Gonchar have been known to turnover pucks in their defensive zone frequently. The Canucks are looking for somebody with more defensive awareness, and the price for a defenseman of that standard is a lot higher. Realistically, the Canucks would have to give up a good prospect and a high pick to get a d-man that will fit their bill, and that is just too much for Benning. The price would be inflated, too, because the market for defensemen is almost empty. Good defensemen are historically difficult to trade for, as they are hard to develop and relatively rare. Any team’s asking price for a top-4 defenseman would be through the roof. Hamhuis’ recovery is going better than expected, according to sources. The current speculation is that he will be back within a month, making a trade for another d-man unnecessary. Benning is a patient general manager and is not prone to making rash decisions. The current defensive corps can weather the storm for the remaining time, and hopefully the Canucks can get back to their winning ways before Hamhuis returns.